This year we’re going to be exhibiting at some great events in Europe. We’re almost ready to head to Madrid for Microsoft TechEd Europe 2013, so if you’re attending this amazing conference, it would be great to meet up and talk! You will have a chance to talk directly to our dev and sales teams, and to see our new applications in action. We’re going to be presenting a bunch of tools for Exchange 2013, Office 365 and Outlook 2013, as well as for mobile devices. We would really love to meet you in-person and to hear your product questions, remarks and feedback. Just visit Booth 12 (CodeTwo) anytime you want, and hang out with us during the Welcome Reception on Tuesday, 25 June. If you want to schedule a meeting, just drop me a line at simon.s [att] codetwo.com. 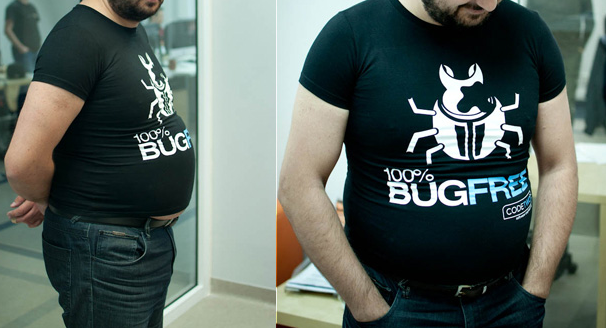 Ohh.. and make sure to grab one of our 100% bug free T-shirts when you get there! This is what it looks like if one of us tries it on. Sorry, but I couldn’t find anyone slimmer in CodeTwo! Ok, these guys somehow pulled it off to draw their bellies in for 5 seconds! And that’s us – meet us at TechEd! See you there! Thank you for your comment. I consulted your case with our Support team – it seems to have been solved by now. Can you confirm this? Unfortunately, from what I’ve heard, we have insufficient data to determine what the root cause was. If you have any more questions, please contact us anytime from Monday to Friday. You can also request a free callback, if you have any sales questions. I have had Customer Support try and fix my problem (“unable to access data”) that occurred during upgrade from v 4.6.1.0 to v 5. Although they tried very hard to fix the problem, despite my repeated emails, now things have gone quite. I followed the upgrade instructions on your website/user manual. It has not worked. Presently I have lost folders. I do not know what has happened. I do not know whether I have actually lost data? Contrary to your description in the user manual, the upgrade process for us has NOT been ‘simple’. Assuming the process in the User Manual is correct and I have followed it properly, then Code Two is not “100% Bug Free”. It is frustrating that no one is getting back to me. We have a business to run, and can’t be ‘left hanging’ for such a critical issue to our business. I do not know the status of my problem from Code Two. I do not know what Code Two intends to try and do about it. I do not know when Code Two will get back to me. Please, we have great respect for Code Two Public Folders (it has been an invaluable tool for our business) but can someone please get back to me as to what is happening as soon as possible.